Tablelands Futures Corporation and the Queensland Agriculture Workforce Network (QAWN) are set to combine forces in a move that will put training the next generation of growers and workforce on the Atherton Tablelands as a top priority. The innovative idea is set to boost the farming sector on the Atherton Tablelands and will be undertaken by TFC in partnership with QAWN’s Leanne Kruss and key stakeholders in the sugarcane, dairy, pork, fisheries and fresh produce industries. TFC chair Michael Lawrence said farmers at TFC’s recent Agriculture Roundtable event were reporting a significant decline in the availability of experienced workers. “There is a definite need for training in specific skill sets, including machinery, stock handling, on-the-job training and bio-security protocols,” Mr Lawrence said. “Agriculture is a sector poised to provide countless jobs and major growth in our community and economy,” Mr Lawrence said. “We want to provide the connections and network to allow investment in our youth and to be at the forefront of innovation and niche business opportunities. “There needs to be more school training for crop cultivation and horticulture, as well as clear incentives for school-leavers to stay in the region and to be trained on the land. TFC will investigate the creation of farming internships, early education pathways, provide a link for several industries to network and coordinate training needs, partner with universities and establish funding for horticultural training projects. Basic animal handling skills and the ability to operate machinery were also pinpointed by experts at the roundtable meeting. According to the National Farmers’ Federation, Australian farmers produce almost 93 percent of the country’s daily domestic food supply and provide more than 1.6 million jobs to the economy. “A recent Australian Farm Institute report highlighted a steady uptake of enrolment in agricultural courses in universities due to the declining mining sector and we hope our region can mimic the trend,” Mr Lawrence added. “We live in an agricultural wonderland and hopefully, with a bit of encouragement, our youth can reap the rewards our land can offer. 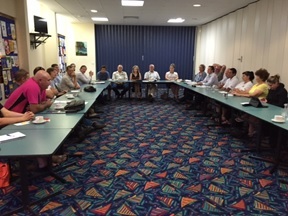 Other key issues discussed at the recent Agriculture Roundtable included a submission to oppose changes to Vegetation Management Laws and recommendations to collate data on the long-term and short-term effects of dry weather. For more information or interviews contact TFC chairman Michael Lawrence on 4096 7407.